You may have seen a character from Kathakali with elaborate headdress, standing next to an image of Taj Mahal of Agra or Hawa Mahal of Jaiur, in brochures on Indian tourism. That is a character from this art form from Kerala, a small state along the southwestern corner of India. The name Kathakali means "Story playing" (Katha in Sanskrit is story and Kali in Malayalam is playing). Over the past several decades, Kathakali has become synonymous with both Kerala and the cultural scene in India. Besides the elaborate headdress and face make up, Kathakali has several unique characteristics. One of them is that the players do not utter any words (although, some of the characters are allowed to utter noises) but with the body and limb movements and the almost infinite gestures of hands and twitching of facial muscles, as well as the eye movements, the players help narrate stories. In the background are drum-beats and classical singing in accompaniment. Another uniqueness of Kathakali is that all characters are portrayed by men- even the female ones. A surprising fact is that all the special effects on the face are painted or pasted on. There is no mask, unlike some other dance-dramas of Orissa, Bali etc., for example. The reason is that the mask will literally obscure the intricate facial and eye movements! All characters in Kathakali also sport very red eyes; this effect is achieved by the application of a past of a herb called "chundappoo). The normal white of the eyes will appear too flat and ineffective. Kathakali does not require much space or elaborate stage settings; usually only approx. 10 sq ft. of stage space is all that is required and a lamp. Thus, this form of classical dance can be performed anywhere. Kathakali's origins date back to the 17th century AD, as a derivative of earlier Kerala temple dance dramas such as Koodiyattam, Krishnattam and Ramanattam. Originally danced in accompaniment to plays composed by gifted royals of Kozhikode's Samoothiri and Raja of Kottayam, through several transitional forms, Kathakali emerged and was enriched by the writings of many more composers. With the renewed interest in Indian classical arts, promoted by Rabindranath Tagore, Kathakali was also nurtured. However, the real impetus for its development and popularization was from the work of Malayalam's eminent poet Vallathol Narayana Menon. He built the Academy of Kathakali studies called "Kalamandapam" where, students were enrolled and given intensive training. Thus, the current popularity and growth of Kathakali owes much to this poet's foresight. The stories narrated by the Kathakali performers are usually derived from the Hindu epics Ramayana and Mahabharatha and the Puranas. Thus, the characters are drawn from the various stories from within these long epics and, depending on the quality (good or bad or high status or lower status etc) often determine the appearance of the costume, make up and headdress. While Hindu themes still dominate, it is heartening to note that themes from the Bible, Buddhism and others have found place in contemporary Kathakali scene. Narration is through singing the stanzas in classical fashion. This is done with the accompaniment of drum beat "maddalam" and "chenda". The playing of the drums require years of training and, when played properly, the drums literally 'speak'. This term means green in Malayalam. This character has elaborate headdress. The make up a green background as the name suggests. This make up is reserved for gods and heroes. Kathi in Malayalam means knife and this character is called by this name as a knife-shape is painted on both cheeks. Otherwise the headdress and make up appear very similar to the Pacha. These make ups are meant for characters who are heroes with some defects or villains such as demons. A classical example is Ravana, the demon king of Ramayana. They also have a ball on the tip of the nose and on the middle of the forehead. As the name implies ("beard" in Malayalam), the distinguishing feature of Thadi is the elaborate beard. This make up is reserved for evil characters such as the rakhshasas (demons). Without an elaborate headdress and with only nominal make up of face, this character is usually demon or a creature from the 'underworld'. This make up is reserved for gentle characters. The make up consists of painting of the face with a yellowish orange pigment. There is no thick white "chutty" used to make up. Women, sages and Brahmanas use this make up. 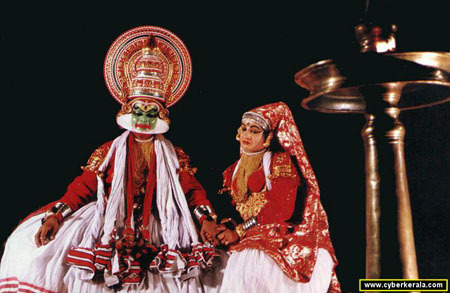 All characters in Kathakali, both male and female wear elaborate dresses. These are supported by a frame that makes the dress appear much larger than the players. Combined with the elaborate headdresses, even more spectacular face make up and the red eyes make for a unique and spectacular show that is Katha kali.